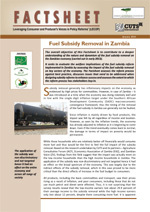 CUTS International is implementing a project entitled ‘Leveraging Consumer and Producer’s Voices in policy Reforms’ (LECOP Project) in Zambia in partnership with Agriculture Consultative Forum (ACF), Economics Association of Zambia (EAZ), and Zambian Voice (ZV) supported by Zambian Governance Foundation (ZGF) over a period of seven months. 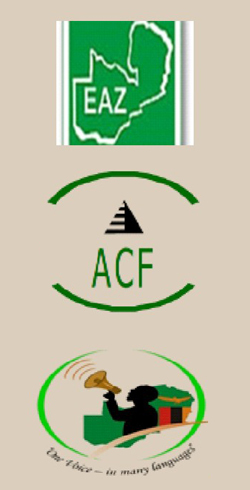 The project is aimed at shedding light on the impact (POSITIVE or NEGATIVE) of this decision on the aggregate demand (consumption investment, government expenditure and net-export) and aggregate supply side (cost of production etc). 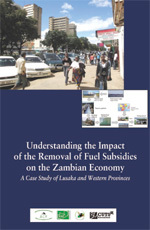 Further and more specifically, the research is also assessing how the removal of fuel subsidy affected the distributional broad-spectrum macroeconomic and microeconomic variables such as National income, Gross Domestic Product (GDP), employment, household income in both agricultural and non-agricultural sectors. A better understanding of these issues will shed light on the kinds of policy interventions and capacity building/awareness generation needs that are needed to inform state and none-state actors’ actions moving forward.